It has come to our attention that Twitter is now OUT of Fashion. In summary, our original account was hacked, and Twitter did not help us get it back. Now we have a new Twitter handle, but we are NOT happy about it. We lost thousands of followers, posts, and our original one word twitter handle. Below is the story as to why be believe Twitter is out of fashion. 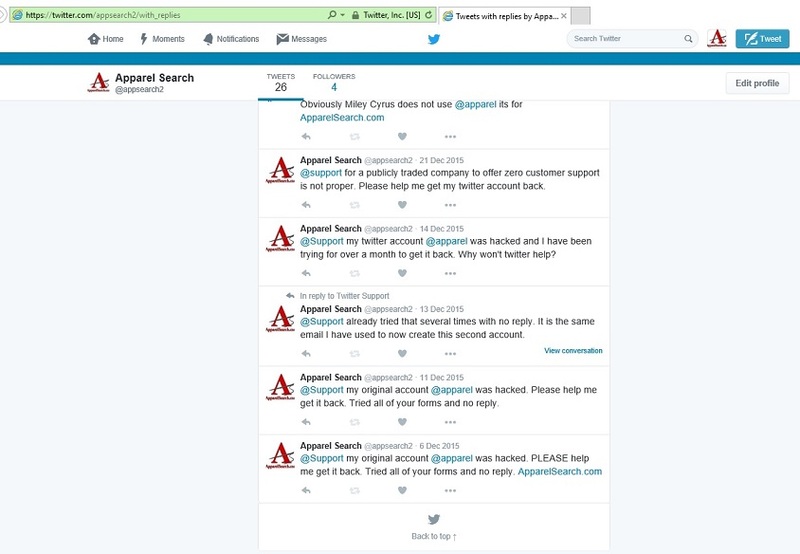 As of April 2016 Apparel Search stopped using twitter because our twitter account was hacked and twitter gave our address @apparel to someone else (possibly the person that hacked our account). All of our posts, several thousand followers, and our fabulous one word twitter address was taken away. Although we had an account with Twitter for several years, we received no help from Twitter to rectify the situation. We noticed on December 6, 2015 that we were locked out of our account, and it was then occupied by "Miley Cyrus". Obviously, it was NOT the real Miley. After "several" months trying to communicate with Twitter, they have NOT offered any assistance to help us get our account back. We actually had to create a new Twitter account just so that we could communicate with their customer service. Between December 6, 2015 to November 26, 2016 (almost a full year), we reached out to twitter to help us get our twitter address back. Even if we could not get our followers & posts back, we desperately wanted to at least get our twitter address back. Although we wanted to 100% stop using twitter FOREVER, we broke down and started a few posts again in March 2018 at our new address. We felt we had no option but to at least have a small presence on Twitter. The reality is that many people use the service, so it is foolish of us to completely stay off the network. With that said, we are still VERY disappointed with the Twitter service. If they give us back @apparel we could forgive them. 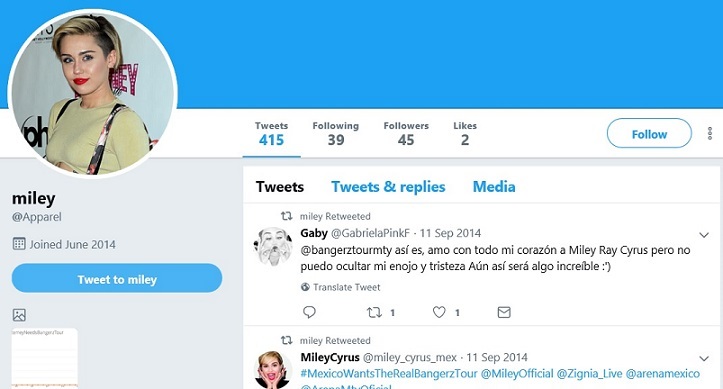 By the way, as of March 2019, our old twitter address is still held by the fake Miley Cyrus account. The account has not posted since we discovered the problem back in 2015. The Miley posts indicate previous years, but the @apparel address was actually used by Apparel Search during those years. Those posts must have moved over when they took our address. Don't forget to hang out at the most fashionable and social network in the universe. We would love to chat with you about fashion at the Fashion Industry Network.